Description: Goddess of light; the North star; Bushel Mother; Protectress against war; She Who attains a profound knowledge of celestial mysteries; Teacher of transcendental wisdom; She Who shines with heavenly light; She Who can cross the sea and pass from the sun to the moon; Queen of the Doctrine of Primitive Heaven; She Who has a kind heart for the sufferings of humanity; Controller of the books of life and death. All who wish to prolong their lives worship at Her shrine. Her devotees forgo meat on the 3rd and 27th day of every moon. To Whom Sacred: the pole-star; Her palace Tou-Shu, 'the-Pivot-of-the-Pole-star'; the number 18. Some of the objects She holds (see Iconography): bow; spear; sword; flag; dragon's head; pagoda; five chariots; sun's disk; moon's disk. Iconography: She wears the Buddhist crown and is seated on a lotus throne. She has three eyes, eighteen arms, and holds various precious objects in Her numerous hands. Male Associates: consort, Ch'en-Chi-Tsung, ----. Sons, nine, called Human Sovereigns. One dressed in red, ruler of birth, is the Northern Bushel; another, the Southern Bushel, dressed in white, rules death. She is derived from Hindu Marici, Ray-of-Dawn, Who is linked with Vajravarahi, Strength-of-the-Sow. She is also called Tao-Mu, Mother-of-the-Way, but the two are distinguised in Her Cycle of Transformations. Also called Tien-Hou, Heavenly-Goddess, below. Also called Tien-Fei, TE]N-FA, ----. 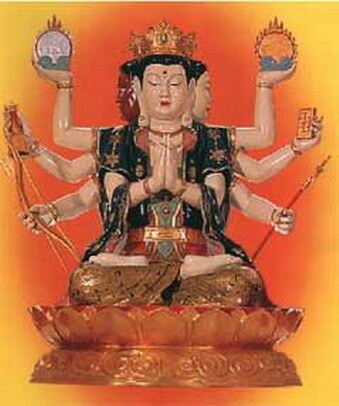 Also called: Tien-Mu, Heavenly-Mother, a weather Goddess Who is linked with Sao-Ts'ing-Niang. Perhaps transliteration variant Tou-Mou, ---, below. Geography/Culture: Chinese: Taoist. At Her temple (125 Waverly Place), in San Francisco hundreds of gilded lamps, trailing scarlet cords, burn eternally (flame-shaped electric bulbs substitute for the original flames) to advance the health and prosperity of a particular family. Description: Goddess Queen of the ocean; Protectress of navigators and fishermen; Compassionate Daring Rider on clouds; Princess of supernatural favour; Empress of heaven. To Whom Sacred: shell-fish; reeds and basket; oranges (they are offered to Her in honor of the dead); weaving; long black-braids; the constellation Sagittarius where She has Her dwelling; psychic powers; clairvoyant trance; the number 9. Iconography: She is represented seated on a lotus or throne wearing the Imperial head dress, and holding a sceptre or a tablet. Male Associates: consort: Tou-Fu-Tien-Tsun, Father-of-the-Bushel-Honoured-of-Heaven. Like Tou-Mu She has nine sons. Chun-T'i, ----, is also called T'ien-Hou, Heavenly-Goddess. Tien-Hou is also called: Mei-Chou, MA-C9, ----. Perhaps to be identified with Tien-Mu, Heavenly-Mother, Who is linked with Sao-Ts'ing-Niang, Broom-Lady. In San Francisco, (see above for the location of Her temple there), She is known as Tin-How. Alternate name for Tou-Mu, Mother-of-the-North-Star, above. Source: Werner DCM 511; New Larouse EM 395, image/403; SF Examiner and Chronicle article, 09/12/93. Description: Goddess of record-keeping; Judge of all people; Keeper of the duties and estates of all Deities. To Whom Sacred: the pole-star. Perhaps transliteration variant of Tou-Mu, Mother-of-the-North-Star, above. worked on: July 1990; July 1991; June 1995.